A comforting soup with a little extra spice. I recently stumbled upon a Yemenite Jewish cookbook from the early ’60s called Yemenite & Sabra Cookery, by Naomi and Shimon Tzabar. It’s the type of cookbook I especially love to discover; the kind that covers a rare topic and is unusually designed. This one has beautiful wood-block print images scattered throughout. The recipes are more like sketches of how to make something instead of being clear directives. On the first page of the book there’s a recipe for zhug (Yemenite hot sauce), and a few pages later there’s a recipe for a very simple white bean soup. 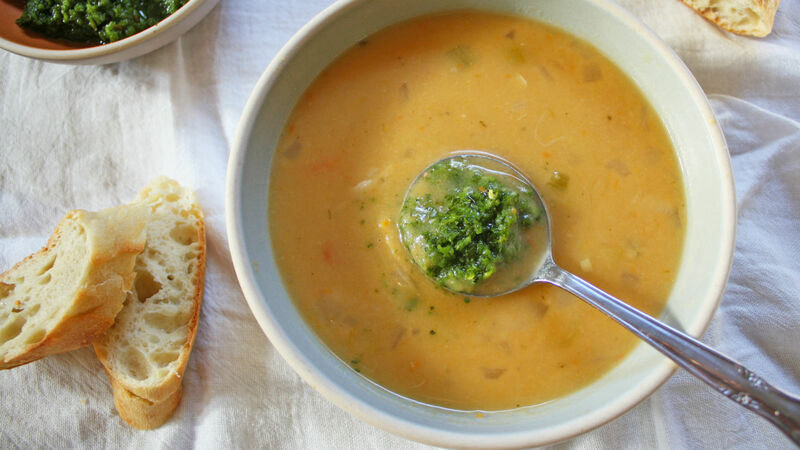 I’ve been a longtime fan of topping white bean soup with homemade pesto or herb sauce. 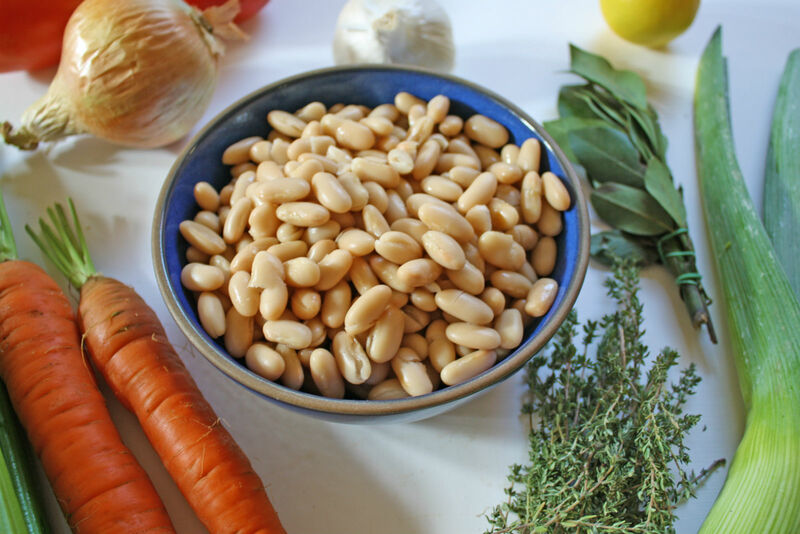 Creamy rich white beans are well complemented by fragrant earthy fresh herbs. As I skimmed through each page, these two recipes jumped out at me, calling to be combined. 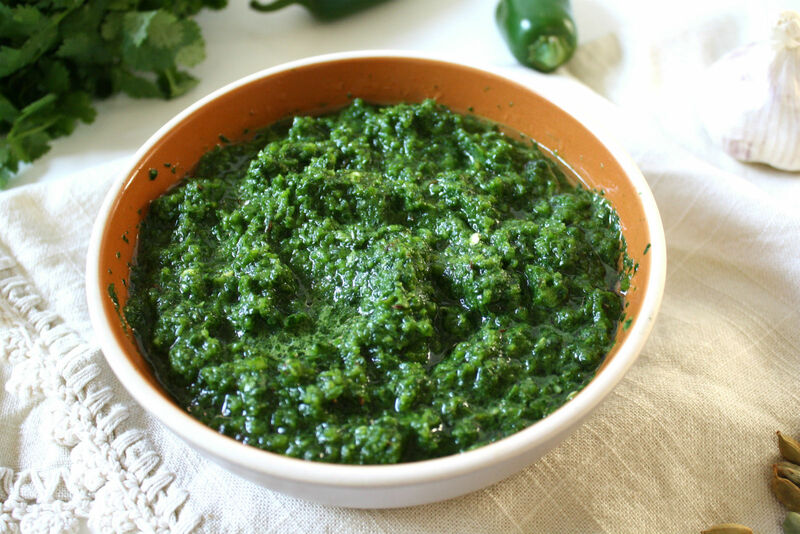 Zhug (or skhug; pronounced s-kh-oo-g) is a classic Yemenite hot sauce. It is found throughout the Middle East, and was brought to and made popular in Israel by Yemenite Jews. It is used to add heat to many dishes, from falafel, to shwarma, to schnitzel, to sabich. 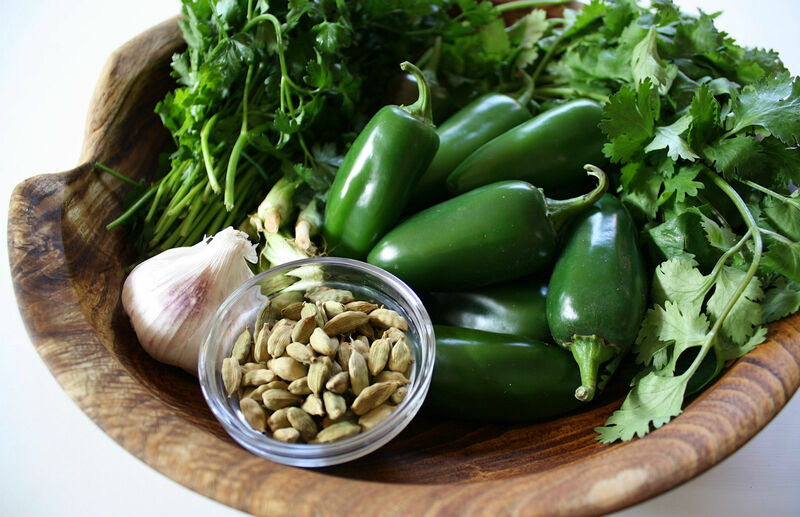 There are countless recipes for zhug, but it is always made with a combination of hot green or red peppers and cilantro/coriander. Often, you’ll find it includes spices such as cardamom and caraway. Zhug is spicy, vibrant, and complexly flavored with the combination of these herbs and spices. It’s not your average hot sauce. This white bean soup is simple at its core and made with leeks, carrots, celery and just a few other ingredients. You can use chicken broth or vegetable broth for the liquid — even water will work. If you have the time, or an Instant Pot (yes! ), making the white beans from scratch will make the soup significantly better. For one, you can infuse the beans as they cook and soften with extra flavor from garlic and bay leaf. Then, the infused cooking liquid can also get added to the soup. You can cook the white beans and make the zhug several days in advance. Once everything comes together, and the soup gets served and topped with the herby zhug, it makes this dish that much more impressive. When I tried my first bite I was instantly warmer; the spice and heat from the zhug, and the comfort of the creamy white beans somehow elicit the feeling of heat from strong sunlight, somewhere very far away. If using dry beans: soak the beans overnight. In a large pot or in an Instapot, cover the dried beans with 3-4 inches of water. Add a large bay leaf and 4 peeled cloves of garlic to the pot. Simmer beans until tender. To a large pot add a generous drizzle of oil over medium heat, and add the diced onion, leek, carrot and celery. Sauté the vegetables until softened, about 6-8 minutes. Add the chopped tomato (or tomato paste), 2 peeled garlic cloves, 1 bay leaf, thyme, and chopped herb stems to the pot. Stir and sauté for another minute. Add the liquid to the pot; if I’ve made the beans from dried, I like to add a few cups of the bean cooking liquid in addition to broth. Add salt and pepper to taste. Bring to a simmer and allow to simmer for 20 minutes. Add the cooked or canned beans to the pot and simmer for another 20-25 minutes. Taste and season as needed. Turn off the heat and add the lemon juice. At this point, you can serve the soup as is. However, I prefer to remove about a third of the soup from the pot. I blend the remaining soup until light and creamy, using an immersion blender. I add the remaining soup back to the pot. This makes the soup satisfyingly smooth, with pops of beans and vegetables. To make the zhug: To a food processor add the de-seeded jalapenos, parsley, cilantro, garlic, cardamom, caraway and salt. Pulse until finely chopped. If you don’t have a food processor, you can also chop the ingredients finely by hand. Transfer the chopped mixture to a bowl. Add the oil and lemon juice, and stir until combined. Zhug will last up to 2 weeks in a well-sealed container, or it can be frozen for up to 3 months. Serve topped zhug to your taste.